Summary: Here is a story about triumph against all odds. When Benjamin Mee decided to uproot his family and move them to an unlikely new home – a dilapidated zoo where more than 200 exotic animals would be their new neighbors – his friends and colleagues thought he was crazy. Mee’s dream was to refurbish the zoo and run it as a family business. The grand reopening was scheduled for spring, but there was much work to be done and none of it easy for these novice zookeepers. Tigers broke loose, money was tight, the staff was sceptical, and family tensions ran high. Then tragedy struck. Katherine Mee, Benjamin’s wife, had a recurrence of a brain tumor, forcing Benjamin and his two young children to face the heartbreak of illness and the devastating loss of a wife and mother. But inspired by the memory of Katherine and the healing power of the incredible family of animals they had grown to love. Benjamin and his kids resolved to move forward, and today the zoo is a thriving success. I am the first to admit that I'm not a regular movie goer. Heck, I'm not even a regular movie watcher, but when the opportunity presented itself to review both the book and movie for WE BOUGHT A ZOO by Benjamin Mee, I jumped at the chance. 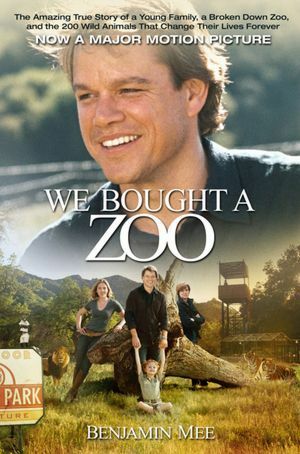 I had seen previews for WE BOUGHT A ZOO and thought it looked like a great family movie. However, being the book lover that I am, I wanted to read the book that the movie was based on prior to seeing the movie. So a few days ago, I sat down with the book version of WE BOUGHT A ZOO. I have to tell you that I was a bit surprised by it, and I don't know that I'd say I loved it. The book description that I included above pretty much tells the story (and sounds a lot like the movie! ), but I have to say that the book and movie were very different. In fact, as I was reading WE BOUGHT A ZOO, I wasn't quite sure how it was going to work as a movie. I felt that the book was a little dry and I didn't feel like I got an inside look into the author's emotions. I guess I just wanted more about how he and his children coped with losing his wife. The book was much more focused on the zoo and getting it ready for inspection and opening. Having said that, Benjamin Mee's story is fascinating and inspiring and I definitely saw the potential for a movie. There were scenes with the zoo and zoo workers that I knew would play well on the big screen. Plus, there were animals... lots of animals; and who isn't a sucker for family movies about animals? You're rarely going to hear me say this, but I definitely enjoyed the movie version of WE BOUGHT A ZOO better than the book one. (Of course it didn't hurt that the movie starred Matt Damon!) The movie took all the cute and funny scenes from the book and brought them to life; and it had lots of gorgeous animals. There were some pretty drastic changes from the book to the movie including the "Americanization" of the story, the timing of Mee's wife's death, and the involvement of Mee's family in the venture. I'd definitely go so far as to say that many of these changes were improvements over the original story, if not quite keeping to the accuracy of Mee's story. But hey... it's Hollywood. I actually found this movie to be extremely heartwarming and inspirational. It not only explored how persistent Mee and his family and the zookeepers were in preparing the zoo for visitors, but it also delved into the loss of Mee's wife and the effect it had on Mee and his children. (This was exactly what I wanted more of in the book!) I thought all of the actors (and especially the kids) did a good job with the script, and WE BOUGHT A ZOO is truly a feel-good family movie. I might have even choked back tears a few times, but I'm like that with movies! This might sound picky, especially coming from someone who doesn't watch a ton of movies, but I really wanted to share this movie with both of my kids; and for the most part, I could. (It has a PG rating.) But here's the sticky part for me. My son is 7 years old -- the exact same age as the little girl in the movie. There was one scene where Benjamin references that he has a daughter who still believes in the Easter Bunny. Hello? My son is hanging on to those childhood beliefs by a thread and I don't think I'm ready for him to hear the truth about the Easter Bunny in a movie just days before he comes. In addition, there was a scene at the end where the little girl says a dirty word (a slang term for male anatomy.) Just putting that out there for you moms! This Easter, be unpredictable, do something crazy and embrace your wild side! Twentieth Century Fox Home Entertainment presents an inspiring adventure based on a true story of one man who brought a zoo back to life and family back together in WE BOUGHT ZOO, arriving on Blu-ray, DVD and digital download April 3. Featuring an incredible musical score composed by Jónsi of the band Sigur Rós, the WE BOUGHT A ZOO Blu-ray is loaded with over 2½ hours of special features including 20 deleted and extended scenes, a gag reel, four behind-the-scenes featurettes, commentary with Director Cameron Crowe, star J.B. Smoove (The Sitter, “Curb Your Enthusiasm”) and Editor Mark Livolsi, and more. The film also features an English Family Friendly Audio Track that earned the Dove Seal of Approval. The Blu-ray and DVD will be available for an average retail price of $24.99 and $19.99 respectively. I really enjoyed comparing and contrasting the book and movie. It kind of added a whole new level to my movie and reading experience. Thanks to Weinstein Films and Think Jam for providing review copies of WE BOUGHT A ZOO. Giveaway alert: I have copies of the WE BOUGHT A ZOO book and DVD to share with one lucky reader. You can host your own book/movie discussion! To enter, just fill out the form below before April 8th at 11:59 p.m. ET. I will randomly select and notify the winner the following day. This contest is open to those of you with U.S. and Canada addresses only -- no p.o. boxes. Good luck! Well I do see a lot of movies, but I didn't see this one. My mom and dad wanted to see it but we just didn't make the time. Scarlett Johanson is starting to get on my last nerve for some reason. Anyway, I like the fact that you gave the parental warnings. I always try to do that when I'm talking about a movie that kids will probably want to watch. I adored this movie; my 'baby' is 28, so I went with my BFF and both of us being widowed, we viewed it with an entirely different eye than most parents would. Neither of us knew anything about it before going, so it was quite startling, but the story and the characters took us in, and we enjoyed it completely. I see movies that are on tv sometimes, usually the old ones on TCM. But I also see two a month from Netflix. No, we almost never go to the theater anymore. I love to read a book, then see the movie. Most of what I get from Netflix is based on a book I read. So this contest is perfect. Thanks! I agree with you - the movie was better than the book this time. Thanks for the great giveaway! I like the parental warnings you included...Thanks for the honest review and the giveaway. I hardly ever say a movie was better than a book. I'm so eager to see this movie. I love animals and find the idea of the story very touching. Wonderful review/comparison! I agree that the movie does sound better but would still like to read the book. I really want to see the movie, and didn't even know there was a book.